Description: Previously unreleased Three Blind Mice live recording now issued with superior audiophile sound on XRCD24! Mastered in 2014 from original analog master tapes by Tohru Kotetsu of JVC Mastering! Beginning March 22, 1974, Three Blind Mice hosted a special jazz festival called "5 Days In Jazz" at Nihon Toshi Center Hall. The live jazz performances were spread across five days and all of them were recorded. 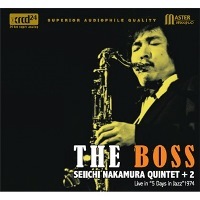 The performance for "The Boss" by Seichi Nakamura Quintet was recorded March 23, 1974. During the new year holidays in 2014, when Takeshi "Tee" Fujii, producer of TBM Records, was tidying up the stock room he found three analog tapes in a sealed box on the shelf. When he opened the box, he found the master tapes inside: the 2-track 15 ips original tapes of "The Boss" performance. The 1974 live performance had never been released. This is an exciting blowing session by Nakamura, who was the top tenor saxophonist at the time, and other first-rate Japanese musicians who were on the roster of the Three Blind Mice label. Alto saxophonist Yoshio Otomo and celebrated guitarist Kazumi Watanabe join the quintet on the title track to add even more excitement. The quality of their performance is extraordinary! Recorded live at Nihon Toshi Center Hall, Tokyo, Japan on March 23, 1974. This is a pure analog tape recording. Mastered utilizing JVC 24bit AD Converter with Digital K2, Rubidium clock. Originally produced by Takeshi "Tee" Fujii for Three Blind Mice. This XRCD24 release produced by Master Music.